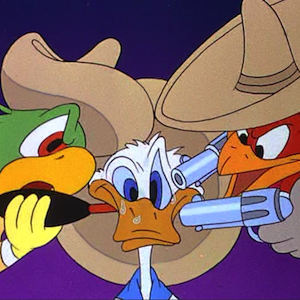 Episode 7: The Three Caballeros | It's time to go to MARS and do so as FRIENDS! This episode might have been the best one yet. I thoroughly enjoyed the tangents and mispronunciations. The amount of mispronunciations in this episode definitely has to be a record. I think that you guys were so concerned with getting the accents right for some of the stuff you were saying that is threw you off. It was awesome. Also, I definitely think you guys do better when you have a strong opinion of or at least some interest in the feature. Saludos Amigos was easily the worst episode you guys have done (I still found it enjoyable, though), and it seems it’s because you guys didn’t really have much to say about it. I don’t really know how you solve it without manufacturing some stuff to talk about, but I just thought I would point it out. Thanks. I agree when we don’t have much to say its not a very good podcast. Part of the issue with Saludos Amigos was that it was a very short movie and didn’t really have a story. Not having the story is the toughest part, its more like watching cartoons on Saturday morning than watching a feature film. Yeah, I just listened to it again, and I think what made that episode lack the usual magic is that you guys were just so bored with the source material that you sounded bored at times during the show (which is, frankly, the worst way to come across on a podcast, in my experience). I suppose if you could recognize that a movie might just be bland before recording you could try to add something extra to the show for that week (personal stories, what you guys have been up to lately, special guest, do a comedy bit, research for more angles from which to approach the movie, etc.). Honestly, just about anything to liven the mood up a little bit would go a long way, I think. We’re taking your feedback into consideration. Gracias amigos! So Venkat shouldn’t do Cinderella impressions and Donny shouldn’t do his Japanese accent hahaha! I understand that you guys didn’t have much to talk about in episode 6, but like Brett said, next time you should try to do other things to fill it in. It sounded like you were bored with the movie and it came out in your podcast. You totally redeemed yourselves because this was great episode! I liked learning about Donald Duck’s family tree. Jose Cuervo! This one was the funniest! Donny don’t sweat the small stuff! Loved the duck genealogy bit lol.